Property Location With a stay at Hyatt Place Canton in North Canton, you&apos;ll be in a shopping district and minutes from Belden Village Mall and close to Pro Football Hall of Fame. This aparthotel is within close proximity of The University Center and Tam O&apos;Shanter Golf Course.Rooms Make yourself at home in one of the 105 air-conditioned rooms featuring refrigerators and flat-screen televisions. Complimentary wireless Internet access keeps you connected, while MP3 docking stations help you enjoy your music in the comfort of your room. Bathrooms have complimentary toiletries and hair dryers. 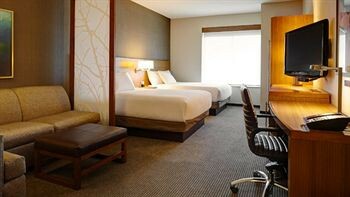 Conveniences include phones, as well as coffee/tea makers and sofa beds.Rec, Spa, Premium Amenities Be sure to enjoy recreational amenities including an indoor pool and a 24-hour fitness center.Dining Satisfy your appetite at a coffee shop/café serving guests of Hyatt Place Canton. Quench your thirst with your favorite drink at a bar/lounge.Business, Other Amenities Featured amenities include a business center and a 24-hour front desk. This aparthotel has 2 meeting rooms available for events. Free self parking is available onsite.